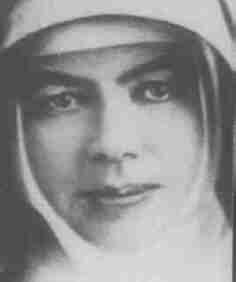 Mary MacKillop is the only Australian ever to be beatified. Given this honor and distinction, one would expect a high level of support of her during her life and after. And, yet, in spite of her incredible support among Australians, today, Mary was resisted repeatedly during her life. The source of this resistance was now from opponents of Christianity but, rather, from bishops and leaders who were unnerved by their seeming loss of power. Mary's Scottish parents moved to Australia before Mary was born. She received a competent education at her father's insistence even though they were unable truly to afford it. Instead, her father and mother scrimped and saved to provide education for their eldest daughterbecause of their conviction that education was the basis for betterment and growth in the world. Mary was a good student and did not take this gift for granted. At the age of 16, while working as a governess for a wealthy family, she decided to become a nun. While working with J.T. Woods, a local priest and friend, she developed a passion for providing education for the poor and outcast.Eventually, she would start a school under Woods' direction with her two sisters. In addition to this school, she helped start an order of nuns within the Church. It would be for this that she would be hurt and attacked. This group was odd in that they offered no interior social distinction between nuns. In other words, all nuns were considered equal within the order. They adhered to a strict vow of poverty because of their devotion to the poor. They entered into the conditions of those whom they loved because of their great love. In doing so, they began to redeem the oppressed and outcast. The most radical move of this order--which would become known as the Sisters of St. Joseph of the Sacred Heart--was to argue for a centralized government under one "mother general" who reported to Rome. This subversion of power and hierarchy would cause distress for Mary and, yet, she remained committed to it. At first, the Australian bishops heartily endorsed this new order. However, when they found out that they could not tell the sisters what to do, they were disturbed. They repeatedly tried to commandeer leadership of the group and, yet, were resisted. They appealed to Rome and the Pope to hand over the reigns of the order to the bishops and, yet, Rome remained committed to their agreement with the sisters. Eventually, her local bishop--Bishop Sheil--excommunicated her. This regrettable decision tried to cast Mary out of the Church. In reality, it exposed the lust for power of the Australian bishops who opposed her. They hoped to cast Mary out of the Kingdom not realizing that she was bringing the Kingdom into the lives of the Australian poor and outcast. Eventually, Bishop Sheil would rescind the order and request Mary to come back to the Church. She did--even though she had never left it. She retained the support of Rome and continued to offer support for the needy even while her opponents seized financial records, spread rumors, sowed dissent and discord and attempted to exert their own control over the order. Eventually, Rome reprimanded the bishops and reestablished the order's centralized government. Though their opponents tried to stop the Sisters of St. Joseph of the Sacred Heart from existing and helping the needy, they never failed to offer support and assistance even while they were being harassed. Their calling was louder than the voices of their detractors. Mary MacKillop saw things differently than so many of us. Instead of seeing her opponents as enemies or adversaries, she referred to them as "instruments in the hands of God." She understood the harassment and abuse she received as painful and uncomfortable but, also, as formative and valuable. God was working good out of evil. This good work would spread throughout Australia and carry the Kingdom with it. Mary MacKillop would be blessed enough to see the spread before dying on 99 years ago, today.